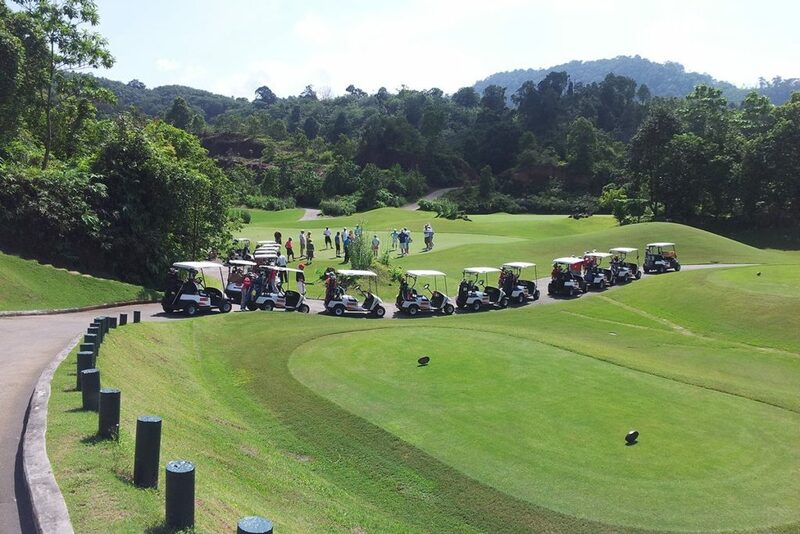 The second annual Phuket Amateur Golf Week started on 24th July 2010 with the complimentary pick up at Phuket international airport and we had a 40 minute drive to the hotel situated at the beautiful Patong Beach. The hotel we stayed in was the Courtyard by Marriot located at the southern end of beach. The rooms we had were all superior rooms which either had a balcony overlooking the pool or looking over the road towards the markets. Registration day was on Friday night with the players getting their welcome bags filled with goodies such as Golfasian golf shirt, cap, magnetic hat clip, map of Thailand golf courses, name tags, so we knew each other’s names and a handy bag tag to convert yards to metres (all measurements in Thailand golf courses are in yards) and the Players handbook for the tournament. Following this, we all moved into the private function area, where we were greeted with Tiger Beer on tap and a great arrangement of Thai and Western food in a buffet setting. As the night finished, most of us were chomping on the bit to get the golf clubs out. After a great buffet breakfast in the hotel, we assembled in the foyer ready to board the bus for our 8.30am departure to our first golf course in Phuket. The clubs were loaded on the bus and we were off. On the way to the course Mark gave us the information regarding the caddies (I have never had one before) and what to expect. After 20 minutes we had arrived at Laguna Phuket Country Club. When we arrived at the club house there were 30 caddies lined up ready to get our clubs, what a sight!! After going into the locker room and changing into the golf shoes we headed onto the putting green to have a putting competition, BUT FOR THE CADDIES. Some of the caddies were quite good, but others, by the looks of their swings had never putted before. After the winners were given their prizes it was off to the first tee. When it was our turn to tee off, Eve took our photos with the group and our caddies. My caddy gave me a summary of where to go and where the trouble was, pity I could take her good advice? The golf course was beautifully maintained. I would describe it as a Parkland style course with plenty of bunkers and water and tree lined fairways. The greens were a lot different to what I’m used to at home but after a couple of holes I got used to it. Every three holes there was a drinks stand where we topped up on water. During our round there was a torrential rain storm and we took shelter for 15 minuets while the rain past. Looking at the nearby green, it was flooded and I though we were finished for the day. Next thing the rain stopped the sun came out and in 10 minutes the water had drained away and we were off again playing. After our round we tipped our caddies ( mine was great, pity I couldn’t do her justice with her advice !) and we had a quick shower and a bite to eat which gave Mark time to finalised the cards and he did presentation at the course. 10 minutes later we were on the bus again and back to the hotel. We woke to an overcast day and driving to the course it started to rain. This didnt last long and after 15 minutes from leaving we arrived at the course. Standing att the course I couldn’t believe the view we were looking over a huge lake. The course was spectacular, great views of the mountains as we weaved in and out of the old tin mine that used to be here. The signature hole was a great par three 147 yards down hill over a large lake that the day , the pin was about 15 feet from the lake, no room for error here. There was a great range of par threes with varing hardness over water or with bunker and the par 5s were unusually hard, they were rated 1 and 3 on the card, good for me I got two shots !! Just as we finished our round the heavens opened again and it started to rain again, quite heavily. Again 20 minutes later as we got on the bus to return to the hotel it stopped and the sun came out. Mark had explained to us that when it rains in Thailand it generally rains for 20-30 minutes sometimes quite heavy, but then it stop, the sun comes out the water drains off and we can play on again. Today was a lazy day for me, stayed around the pool and did a bit of shopping at the local market for the family back home. At night, Mark had arranged a Two for One drinks offer for the group at the hotel. By looking at the way some of the group drink, you think it was going to be their last drink for a week. I had been waiting all week to play this course. I have been looking at the pictures and seen the PGA events being held here, and was keen to follow the footsteps and hopefully golf shots of the stars that had been here before me. Wow what a course. As we walked through to the players locker room you could see the players that hold the course record here, Greg Norman and Fred Couples then the amateur record Tiger Woods some list of the whose who is world golf !!! The locker room had a Jacuzzi and spa in it, we were certainly in for some experience today. The sign of the first tee told us green speed was 8.7 and the forecast was for fine weather. Play got underway and the first hole was a water carry to a narrow green, then next was a par three over water to a tightly tucked pin position. The holes here are either flowing around the large lake that was once an open cut tin mine or through the forest around the mountain. The conditioning of the course was fabulous and they just had 4 inches of rain in 6 hours. After the round we stayed in the outdoor eating area admiring the leaderboards of all the events that have been held at the course. After a 25 minute ride home we enjoyed the 2 for 1 happy hour that the hotel had arranged for the group. After an early start that saw us have a group photo at the hotel, we boarded the bus to a torrential storm, after the 10 minute drive to the course the rain had stopped the sun came out and we were treated to the best golf course in the world that I have played. Red Mountain was official opened in March 2006 and the course is absolutely amazing. This course is designed around a disused tin mine. The course name comes from the large exposed red mountains that can be seen littering the course landscape, sometimes you need to play around the mountains, and sometimes the mountains are right next to the green. There are no two holes alike and the designer has used the change in landscape and altitude changes to highlight the enjoyment of the golfer and the visual aspect is a photographer’s delight. If I was to single out any holes for special mention, it must be the Par 3 17th a 155 yard par three straight down hill. When you arrive on the tee it looks like you could throw the ball onto the green, it has to be a 120 metre sheer drop to a green protected by a single bunker on the right and guarded by the mountainside on the left and rear of the green. The Par 5 18th is the other stand out hole for me. 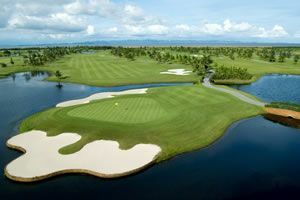 You stand on the tee and see jungle on the left and large mountain on the right hand side of the fairway and water down the left side of the fairway crossing down to a large dam on the right. After successfully negating my way down the fairway for two, my third shot was a green protected by water coming right up to the greens edge on the right hand side, with a bunker long and right and the edge of the Red Mountain all the way up the left hand side of the fairway. We had a group shot overlooking the green and fairway on the 18th hole and we headed back to the hotel for or farewell dinner party. Our farewell dinner party was held in the same area as the Welcome Party, there was another great selection of Thai and Western Food on offer as well as Singha Beer and spirits. Mark started off by giving us a run down of events that are happening next year in the other great areas of Thailand , such as Hua Hin , Chiang Mai and Pattaya. He then announced the daily winners, and they all received a teak elephant and a shirt and cap. Coming into the overall winners we found out that 3 points had separated the top three positions, this year’s winner was Andrew Kennedy, and his prize was a personalised golf bag with his name embroidered on it. One of the items was a Golfasian shirt that the whole group had signed. I think Dominic really wanted this shirt because he kept on bidding on it even when the bid was with him. I think it had something to do with the auctioneer kept lifting Dominic’s hand up each time. Dom has to eventual get up and walk away from Brent so he didn’t bid any more. A few other items were auctioned off and the THB 8900 raised was given to Montry and Eve. The night finished off around 10.30 pm, most of us exhausted after a long day of golf and farewell party and now it was time to pack ready for our flight home. We had an afternoon flight back to Melbourne, so we used the morning as a relaxing day, catch up on a bit of shopping. Montry and Eve transferred us all back to the Phuket airport and farewelled us and hope he would see us back again soon. We were a part of a large group from Victoria and we all had a great time. I will be telling the members of our club what a great time we had in Phuket and I’m sure next time there will be many more players coming to play in the Golfasian Amateur Golf Weeks whether it’s in Phuket or Pattaya or Chiang Mai. The team at Golfasian, Mark, Montri and Eve did a fantastic job of looking after all aspects of the tour and to keep 30 individuals happy is never an easy task. Every requested was met with a big smile and the tour went off without any hiccups. 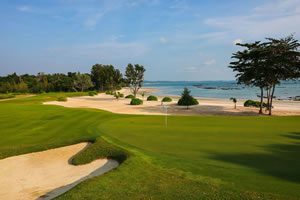 If you are thinking of a golf holiday in Thailand, I would have a look at what Golfasian is offering when you want to travel.